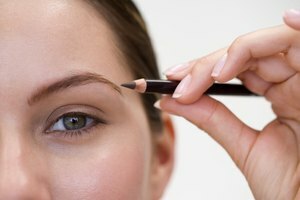 If you have difficulty getting a straight line of eyeliner on your eye, consider sharpening your eyeliner pencil prior to use. Not only are sharpened eyeliner pencils easier to use, they help make your eye makeup look more defined as well. Sharpen your eyeliner pencils once a week to get rid of surface dirt or bacteria and to keep the point sharp. If possible, use a sharpener designed specifically for use with eyeliner pencils instead of a regular pencil sharpener. Minimize the breakage of your eyeliner pencil by cooling it down prior to sharpening it in your freezer or refrigerator for an hour. Or you can simply store your eyeliner pencil in the refrigerator or freezer so it is always ready for sharpening when you are. If you ignore this step, you may find that your eyeliner pencil will break and crumble when you sharpen it. Place the tip of the eyeliner pencil into the hole of the pencil sharpener. Pencil sharpeners may have different diameter holes, so make sure that you select a pencil sharpener that best fits your particular eyeliner pencil. Turn the eyeliner pencil gently in the sharpener until you have achieved a well-defined, sharp point. Remove the eyeliner pencil from the pencil sharpener. 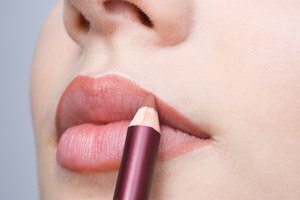 Discard any wood shavings produced from the sharpening of your eyeliner pencil. Apply the eyeliner to your eyes as part of your makeup routine. Consider purchasing automatic eyeliner that automatically sharpens the eyeliner prior to use. You can purchase automatic eyeliner from a beauty supply store, a makeup counter or via the Internet.